At Russ Andrews Accessories our passion is music. 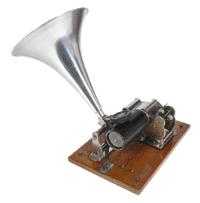 The phonograph cylinder (commonly known as ‘wax‘ cylinders) was not the first audio format. Transcriptions of sound, called phonautograms, could be made using a device called a phonautograph, invented by Edouard-Léon Scott de Martinville in France and patented in 1857. The phonautograph had a horn or barrel which transmitted sound to a membrane, to which hog‘s bristle was attached and this moved, enabling inscription to a visual medium. Initially, a lamp-blackened glass plate was used and later paper. The device was used to study acoustics and it was not understood that the recording contained enough information for playback. German physicist and instrument builder Rudolf Koenig made phonautographs and went on to become a pioneer experimenter with sound recording equipment including the phonograph. Bizarrely, in 1874 Alexander Graham Bell created a working phonautograph by attaching a recording stylus to the ear of a dead man! Modern technology has not forgotten the phonautograph… computer technology enabled playback of these very early ‘recordings’, but not until 2008: the original recording was made on 9th April 1860. [Readers may remember Charlotte Green, the newsreader on the Today programme on BBC Radio 4 famously dissolving into a fit of giggles after reading the story of the computer transcription of the recording – Ed]. The earliest device enabling playback is the phonograph. The theory behind the device was produced by another Frenchman, Charles Cros, in April 1877 and submitted to the French Academy of Sciences. It was presented to the public in December 1877 by which time Thomas Edison had produced a working model: Edison had developed the theory between May and July 1877. The theories of Cros and Edison were arrived at independently. The device invented by Edison was a development of his work on the telegraph and the telephone… he wanted to know if a telephone message could be recorded in a way similar to a telegraph message. Edison‘s device was able to both record and replay sound: the initial recording medium was paraffin paper but this was changed to a metal cylinder wrapped with tin foil; a stylus created indentations in the foil using an up and down motion. Interestingly, the early patents show that Edison considered recording a spiral onto a disc but preferred cylinders since they allowed a constant velocity of the stylus in the groove. The invent ion was improved by Alexander Graham Bell, his cousin Chichester Bell, and Charles Sumner Tainter whilst Edison was working on the incandescent lamp. In Bell‘s model, wax replaced tin foil for the cylinders, and the machine was called Graphophone. In 1886, vertically-modulated engraved recordings using two of the group of three, and Edison licensed these wax cylinders. Having succeeded in making the lightbulb, Edison then resumed work on the phonograph and produced the New Phonograph, to be followed by the Improved Phonograph and finally the Perfected Phonograph in 1888. At that time the playing time of the cylinder was only two minutes, and there was no way of mass-duplicating cylinders until 1901. Phonographs themselves are still traded by specialists and may even be found on eBay. There are a number of enthusiasts‘ societies, including the City of London Phonograph & Gramophone Society, founded in 1919. The types of cylinder are of interest. Initially, there were various types of cylinder incompatible with each other and a standard system was decided upon by record companies in the late 1880s. The s oft wax types produced in the 1880s made of paraffin and beeswax could only be played some twenty five times, but in 1890 Charles Tainter patented the use of hard carnauba wax. By 1892 Edison cylinders were of a type now known to collectors as ‘brown wax’. 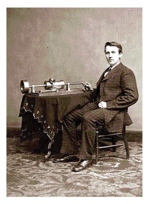 The Edison Concert Phonograph, which had a louder sound and a larger cylinder, was introduced in 1899. Production of both the Concert Phonograph and the larger Concert Cylinders ceased in 1912. In 1902 Edison Records launched a line of improved hard wax cylinders marketed as ‘Edison Gold Moulded Records’. These could be played over one hundred times. 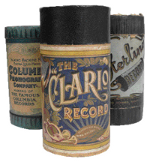 In 1906 the Indestructible Record Company began marketing cylinders made of celluloid, a hard plastic. These so called ‘Indestructible’ cylinders were arguably the most durable form of medium in the analogue era (even more so than vinyl records) and do not break if dropped. The only disadvantage was that they could not be recorded over as could wax cylinders. This superior technology was purchased by the Columbia Phonograph Company. The Edison company then developed their own type of long lasting cylinder, consisting of a type of plastic called Amberol (which was blue in colour and similar to the then contemporary bakelite) around a plaster core. These were called Blue Amberol cylinders, the earlier Amberols being made of wax. In 1908 Edison introduced 4 minute cylinders, having twice the playing time of standard cylinders, achieved simply by shrinking the groove size and spacing them twice as close together in the spiral around the cylinder. Edison ceased marketing cylinders in 1929. Other types of cylinder are the Lambert and the black wax. The early inability to mass produce cylinders meant that recording artists had to perform pieces repeatedly, which presumably means each recording was unique. Reportedly, the medium‘s first major African-American star George Washington Johnson was obliged to perform his ‘The Laughing Song’ literally thousands of times in a studio during his recording career. Sometimes he would sing ‘The Laughing Song’ more than fifty times in a day, at twenty cents per rendition. Incredibly, phonograph cylinders are still being made. Two companies specialise in historic recordings – one of them, the Vulcan Cylinder Record Company in Sheffield – lists twenty four titles in its catalogue including both historic and recent (2007) recordings. The following websites have more information, including copies of phonograph recordings to download.